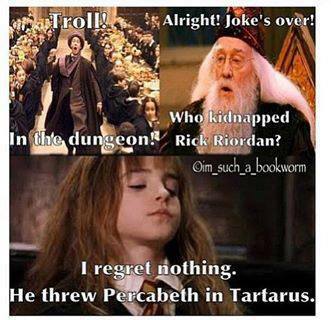 Troll in the Dungeon. Crossover between harry potter and real life. Wallpaper and background images in the The Heroes of Olympus club tagged: the heroes of olympus percy jackson annabeth rick riordan meme the mark of athena. This The Heroes of Olympus photo contains portret, headshot, and close-up. Do u really believe that? That is exactly what I would have done!